Light and fluffy sweet rolls with a hint of pineapple and coconut. Perfect paired with BBQ or enjoyed warm with butter. In a small mixing bowl combine warm water, yeast and a pinch of sugar. Allow to sit at room temperature until the mixture is foamy. In the bowl of your electric mixer, combine, yeast mixture with pineapple juice, coconut milk, melted butter, honey, eggs and salt. Mix on low until combined. Slowly mix in flour ½ cup at a time until the dough pulls away from the sides and is only slightly sticky. You may not need to use the full 6 cups. Turn mixer to medium/low speed and “knead” until the dough is elastic, about 6 minutes. Turn dough out into a greased bowl, cover with plastic wrap and set in a warm spot to rise. Allow dough to double in size. 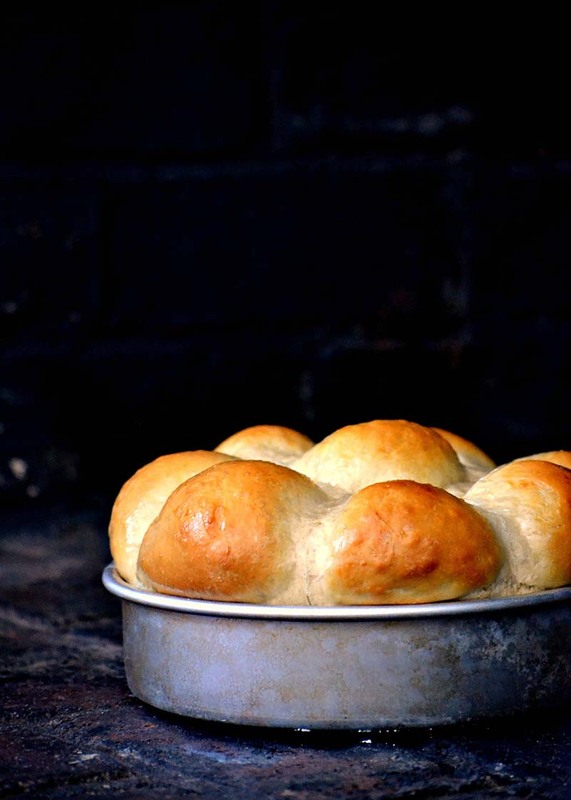 Set rolls aside to rise a second time, until they have doubled in size. Meanwhile preheat oven to 350°F. Once rolls have doubled in size, brush with an egg wash (beat 1 egg with 1 tablespoon water) and bake until golden on the tops. Approximately 25-30 minutes. Recipe created by Bakeaholic Mama. Does it really take 1 Tablespoon of salt? Yes, this recipe calls for 1 tablespoon of salt. You can reduce the salt to as little as 1/2 teaspoon. Keep in mind that with the reduced salt level, the dough will most likely rise faster. First batch in oven, second batch in fridge to see what the taste difference will be in 24 hours. I have a recipe I’ve used for many years, very similar in fact, however, this dough has “the” taste tweaked perfectly. I always taste a pinch off dough as it’s working, so other than the hot out of oven taste test…I’d say this is 99.9% sure winner. Soft, lovely dough. BTW, used 2 teaspoons kosher coarse salt rather than tablespoon (that pinch of dough taste). Thanks Bakeaholic Mama, I look forward to seeing more from you in the future! I’m very excited to try this recipe. I’m usually intimidated by breads, but this sounds easy to make and ohhhh so delicious!.. Thanks for the recipe!! These look great, I can’t wait to try them!